CPA Praises Tax Reform 2017 "
It doesn’t look like any tax reforms will be enacted in President Trump’s first 100 days in office. However, U.S, Treasury Secretary Steven Mnuchin is on record as saying that he expects a new tax law to be signed during the summer. CPA’s also want this done by the August recess. Secretary Steven Mnuchin has been working closely with the leadership in the House and the Senate on looking at a combined plan. During his campaign, Trump vigorously stumped for major tax reform, highlighted by several proposals designed to cut income taxes and stimulate business growth. Although he hasn’t offered further insights since taking office, the president has repeatedly advocated an overhaul of the tax system and promised to reveal more details in his plan in the upcoming weeks. The House GOP leadership issued its own “blueprint” for tax reform last year. At this point, Congress is poised to tackle a repeal and replacement of the Affordable Care Act (ACA), the health care law known as Obamacare, before it sets its sights on tax reform. Note that the ACA includes several tax provisions, such as a 3.8 percent surtax on “net investment income (NII), that could fall by the wayside. The nation’s lawmakers will also consider a border adjustment tax on imports that was a component of the House GOP plan. Separately, Trump has proposed a tariff plan, but there appears to be some room for give-and-take. Overall, the House Ways & Means Committee is expected to rely on the 2016 blueprint as a starting point for negotiations. The Senate Finance Committee has been mostly silent on the issue. What will ultimately be included in tax reform legislation? There are no guarantees, of course, but the following provisions have been prominently mentioned by President Trump, or the House Republicans, or both. Income tax rate cuts and a reduction from seven to three tax brackets. A cap on the dollar amount of itemized deductions. Consolidation and revision of rules for dependency exemptions and child care expenses. Enhancement of the Section 179 deduction for business property. A reduction in the top corporate income tax rate to 15 percent. Special tax breaks for manufacturing firms. A one-time repatriation tax to discourage tax inversions. Repeal of the estate tax accompanied by a revision in the step-up in basis rules. At the very least, sentiment for significant change remains strong and CPA’s hopeful. 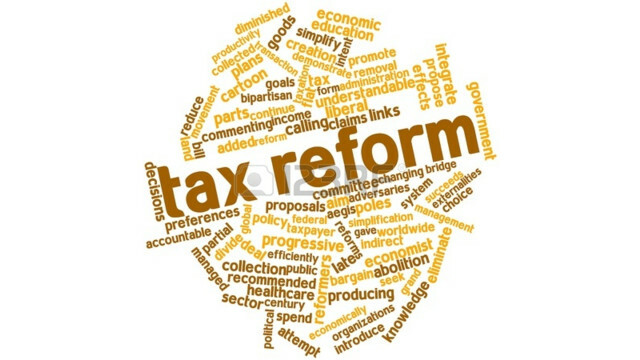 Tax reform is our number one objective for most CPA’s and clients alike which is critical to getting to economic growth. There’s trillions of dollars offshore that will come back and this will create jobs and this will create investment and we need to make sure U.S. businesses are competitive. Finally, the Treasury Secretary has reiterated the contention of the Trump administration that tax reform should not be dependent on tax revenue without taking economic growth into account. Detractors from both sides of the aisle have expressed concerns that the proposed reforms would only add to the growing budget deficit. Naturally, agreements worked out in the back rooms of Congress may depend on what numbers are used and how they are computed.